This impressionistic tapestry "Fishing in the Spring - Van Gogh" shows the work of Van Gogh created between 1886 - 1887. These works were created around the river Seine, which is an integral part of Parisian and French life. Here we see Fishing in the Spring, the Pont de Clichy (Anieres) by van Gogh, where fishermen are fishing on the river, with the bridge and local flora nearby. Van Gogh produced an incredible number of works which varied slightly in style, though all bore his impressionistic qualities. Here we see a scene of daily life on the Seine. 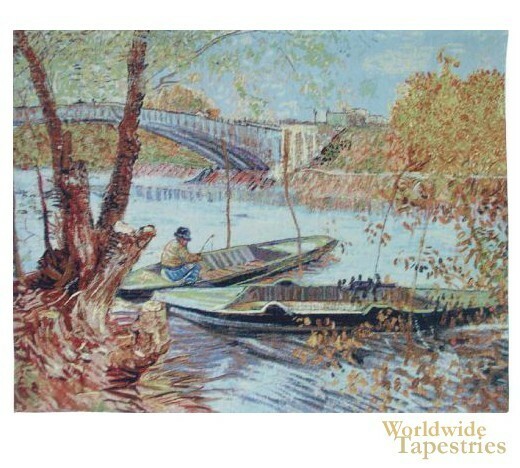 This fine art tapestry "Fishing in the Spring - Van Gogh" is backed with a lining and has a tunnel for easy hanging.